An innovative, convenient and secure crypto app. Encrypt unlimited bits. Remember only a bit. 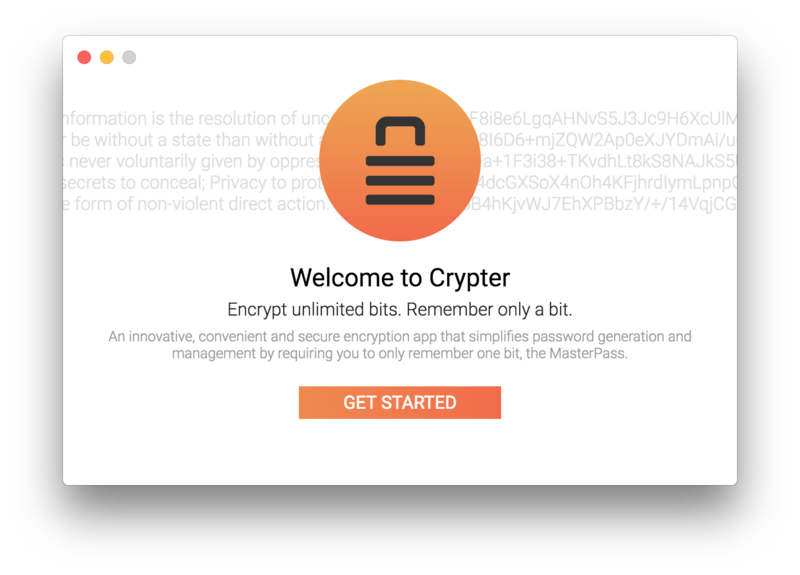 Crypter is an innovative, convenient and secure cross-platform crypto app that simplifies secure password generation and management by requiring you to only remember one bit, the MasterPass. This is based on Crypto.Sync (an end-to-end cloud encryption client), which is a more elaborate implementation of the idea. So please check it out as well! All prebuilt binaries for all major platforms are available under releases. Crypter v3.1 is a crypto app that can decrypt and encrypt any arbitrary data. This version has been released and fully tested for macOS (OSX), Linux (for all distros via AppImage) and Windows (32 & 64 bit). All core modules (modules that provide the core functionality) are fully tested (90%+ coverage). Some end-to-end tests have been written, but end-to-end testing is still mostly a work-in-progress. The next major release is v4.0 and any work for it is done in the "dev" branch. All features to be implemented for the next major version can be found at https://github.com/HR/Crypter/milestones/v4.0. Feel free to send PRs to speed this up! Please open an issue if you have any suggestions! One key to derive them all! Crypter derives a MasterPassKey from the MasterPass obtained at setup by using the PBKDF2 key derivation algorithm (see below for the specification). It then uses PBKDF2 to derive a number of encryption keys from the MasterPassKey that can be used for the encryption of files. This method allows for the generation of very secure encryption keys for data encryption. Moreover, by publicly storing the credentials used to derive the MasterPassKey and the salts used to derive the encryption keys, you are able to produce the encryption keys at will and without needing to store them securely. Your MasterPass is the only thing that you need to remember. Crypter never directly encrypts anything with your MasterPass. Instead, it derives a MasterPassKey from it, which it then uses to derive the encryption key used to encrypt your file. Every time a file is decrypted, the encryption key is re-derived from the MasterPassKey. Every time you set the MasterPass through the setup or reset it through Verify MasterPass, the MasterPassKey is derived from the MasterPass using a newly generated set of (random) credentials. These credentials are used to re-derive the MasterPassKey every time that Crypter is executed (i.e. the app is launched). Authentication with the AES-256-GCM symmetric block cipher is used by default. This ensures that data integrity is verified on decryption and allows the app to detect tampering or data corruption. When encrypting a file, Crypter first creates a temporary hidden directory, namely &apos;.crypting&apos;. It then encrypts the user-selected file with the crypto defaults and flushes the encrypted data to a file in the directory, namely &apos;data&apos;. It also writes the public credentials to a file within the same directory, namely &apos;creds&apos;. Finally, Crypter compresses the directory to a tar archive with the name of the user-selected file and the &apos;.crypto&apos; extension appended to it. The decryption process is essentially the inverse of the encryption process. During decryption, Crypter creates a temporary hidden directory named &apos;.decrypting&apos;. It then reads the credentials from the creds file and decrypts the data file into the original file with its original file name and extension, as deduced from the CRYPTO file name (e.g. the extension for "file.txt.crypto" would be ".txt"). This issue occurs because the MasterPassKey that was originally used to derive the encryption key on is not the same as the MasterPassKey derived with the reused MasterPass. Since Crypter uses randomness to generate secure credentials, this second set of credentials will be quite different from the original set. As a result, the derived encryption key is incorrect and yields this error. See Achieving portability and same MasterPass reuse for instructions on how to successfully reuse the same MasterPass. To achieve portability on Crypter, the set of MasterPassKey credentials need to be exported from Crypter on the source machine1 and imported into Crypter on the target machine2. Please refer to the FAQs for instructions on how to perform the above steps. The machine where the CRYPTO file was initially encrypted. The machine where you wish to decrypt the CRYPTO file. Crypter follows a security-first practice. This means that security is its highest priority and first consideration. Thus, while Crypter seeks to make encryption more convenient, it always defers to maintaining a high level of security. Crypter never stores your MasterPass in memory or on the filesystem. This substantially improves the security of your MasterPass. You are only asked to enter the MasterPass when you first set, reset or verify it. Whenever you enter your MasterPass, Crypter derives a MasterPassKey (using a set of generated credentials) and then immediately discards the MasterPass. The MasterPassKey is then securely stored in memory and used to derive the encryption keys. Since these credentials are derived via a one-way function, they cannot be used in any way to derive the MasterPass. Crypter uses a WeakMap to store the MasterPassKey inside the MasterPassKey class using a closure function. This makes the MasterPassKey data held in the object (externally) inaccessible, consequently increasing the protection of the MasterPassKey. The MasterPassKey is never flushed to the filesystem and is always stored in (main) memory. Since JS does not give control over or allow such a low-level operation as wiping memory, the program relies on the garbage collection and volatility of the main memory for the permanent erasure of the MasterPassKey stored in memory. A decent number of iterations (see the above specifications) are used in the derivation of the MasterPassKey to mitigate brute-force attacks. A good amount of iterations are also used during the derivation of the encryption keys from the MasterPassKey. Consequently, performance and speed are not significantly compromised. For critical applications, you may choose to select 10,000,000 iterations instead of the default number (in app/core/crypto.js). Please refer to http://nvlpubs.nist.gov/nistpubs/Legacy/SP/nistspecialpublication800-132.pdf for more information. Crypter generates a new set of random credentials for deriving the MasterPassKey every time the MasterPass is set (at setup) or reset. Crypter employs randomness to mitigate brute-force attacks and thus drastically improve security. After walking through the setup, you will have established a MasterPass. You can then launch Crypter and verify it. After doing so successfully, you will see the main Crypter window. Here, you can simply drop or select the file you wish to encrypt and then wait for the process to complete. You will then see the file and encryption information (i.e. the encryption key and the path of the encrypted file) in a new window. How do I decrypt a CRYPTO file? The following instructions assume that the CRYPTO file that you wish to decrypt is being used with the same MasterPass that you set at setup and also that you have not reset it since that time. If this is not the case, please refer to Reusing the same MasterPass. To decrypt a CRYPTO file, you will need to launch Crypter and verify the MasterPass. After doing so successfully, you will see the main Crypter window. Here, you can simply drop or select the file that you wish to decrypt. After a few seconds, the process will complete and you will see some information about the file and its original encryption in a new window. By default, the decrypted file has "Decrypted " prepended to its file name. This error means that either your Crypter file (i.e. the data file) is corrupt/tempered, that you are on a different machine than the one originally used to encrypt the file or that you have previously reset your MasterPass. For the last two cases, please refer to Reusing the same MasterPass and Achieving portability and same MasterPass reuse. Why can&apos;t I decrypt a CRYPTO file on a different machine with the same MasterPass? Why can&apos;t I decrypt a CRYPTO file with the same MasterPass? Where are my encrypted/decrypted files placed? By default, every source file that you encrypt/decrypt gets encrypted/decrypted to the same directory where the source file is located. How can I access Crypter&apos;s preferences? You can access Crypter&apos;s preferences by either clicking on the cog icon in the main Crypter window or by going to Crypter > Preferences... from the menu. How can I reset my MasterPass? You can reset your MasterPass by clicking on the "Forgot it" link in the Verify MasterPass window. This takes you to a new screen where you can enter a new, valid MasterPass. Once you&apos;ve entered it, click the &apos;Reset&apos; button and you&apos;ll be sent back to the verify screen where you can verify your new MasterPass. What is a valid MasterPass? MasterPass credentials are a set of values that are required to derive the MasterPassKey from the MasterPass. These values have a pseudo-random element and are cryptographically linked. Every MasterPass that is set or reset with Crypter has a unique set of MasterPass credentials. These yield a distinct MasterPassKey, even when a MasterPass is reused. How can I export my MasterPass credentials? To export your MasterPass credentials, you can first open Crypter&apos;s preferences (see above). From this screen, click on the "Export" button. A dialog will appear from which you can select the folder where you wish to export the credentials. A success message will confirm a successful export. The exported MasterPass credentials file is always named credentials.crypter. How can I import my MasterPass credentials? To import a set of MasterPass credentials, you can first open Crypter&apos;s preferences (see above). From this screen, click on the "Import" button. A dialog will appear from which you can locate your credentials.crypter file. After you select it, a success message will confirm a successful import and you will have to verify the MasterPass for the credentials. NOTE: while Crypter does not require the MasterPass credentials file to be exactly named credentials.crypter, it does require the file&apos;s contents to be unaltered from when it was exported from Crypter. If it has been altered, the import may fail. Crypter is developed in the "dev" branch, which may be unstable at times. This branch should typically be used for pull requests. The "master" branch will always be kept stable. All major configurations that you can apply are found under app/config.js. This includes changes to certain cryptography settings. Please be advised that altering these may break functionality and portability.